This is probably the most iconic, classic American dessert in our country’s edible lexicon. Every family has their own recipe and tradition in making this pie. For some, like my friend Dan, it is his way of signaling the arrival of the fall season. For others, it is a friendly reminder of home. For me, it was something I never really enjoyed as a child, since my mother did not make them and my only experiences were with the pre-made frozen ones that always seemed to have an overly glutinous filling. Now that I’ve gotten into the habit of making my own pies, and tasted that fresh apple filling, I have been able to forgive all those pies that haunted me during my youth… these things are actually good! 2. Peel, core, and cut the apples into 1/4 inch thick slices. If you prefer a chunkier filling, cut the apples into 1/2 inch cubes. You should have about 8 cups worth of apples. 3. In a large skillet or pot, combine the apples, sugar, cinnamon, salt, flour, lemon zest, lemon juice, and nutmeg. Cook over a low heat until the apples are warm. Stir in the butter and continue to cook several minutes more until the apples begin to release their juices. 4. 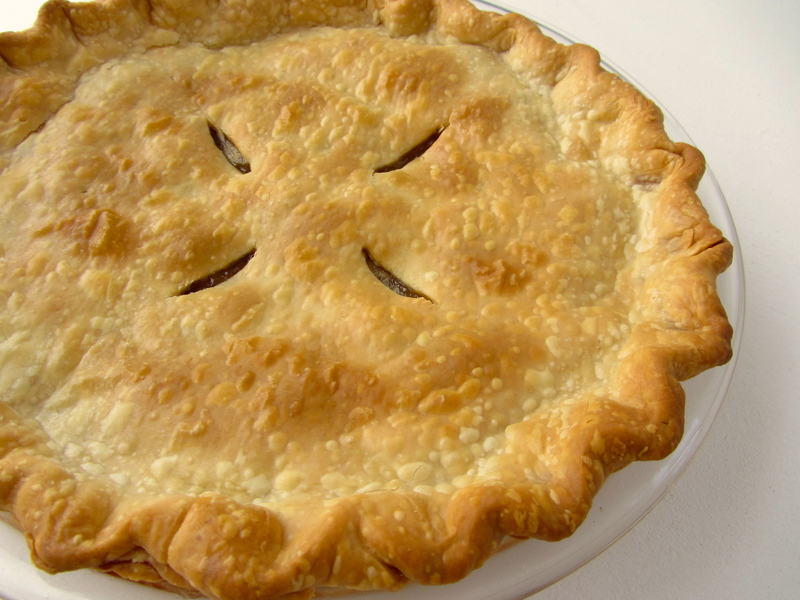 Lay one of the ready-made piecrusts into a 9.5 inch pie dish. Be careful not to stretch the dough, else it may shrink while baking. 5. Pour the apple filling into the pie dish. Cover the pie with the second piecrust, gently pressing down to remove any air pockets. Wrap the overhanging top dough under the lower one and pinch the edge into a fluted pattern, or crimp with a fork. Cut several 1.5 inch slits on the top to allow steam to escape while baking. 6. Bake on the center rack at 475F for 40 – 45 minutes, rotating halfway through, until the top is crisp and golden. Cover the edges of the pie with aluminum foil when you go to rotate the pie to prevent them from burning. Allow the pie to cool before serving. * Flavors and textures depend on the types of apples used. My favorite combination is equal parts Granny Smith and Golden Delicious apples. The Granny Smiths have a tartness that is balanced by the sweetness and texture of the Golden Delicious.